India has created space history by successfully launching 104 satellites on a single mission, comprehensively overtaking the previous record of 37 satellites launched by Russia in 2014. With this launch, ISRO has cemented India’s position as a space superpower. The increasing competition for space-related prestige in Asia has the makings of the Cold War space race. India seems to be winning the race for now. It is good for business too. What is the spectacular record? India has not just broken the Russian record, it has shattered it to smithereens.104 satellites launched from a single rocket - this is nearly triple the old record of 37 satellites Russia sent into orbit in 2014. Executed from the Satish Dhawan Space Centre in Sriharikota, Andhra Pradesh, this was Indian Space Research Organisation (ISRO)’s first space mission for the year 2017, and the most complicated mission it has ever carried out. 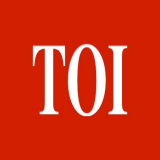 The space agency began the countdown for the launch of the Polar Satellite Launch Vehicle (PSLV)’s 39th flight on Tuesday after the Mission Readiness Review committee and Launch Authorisation Board gave its approval for lift off, ISRO said. The PSLV-C37/Cartosat2 Series satellite mission included the primary satellite (Cartosat-2) and 101 international nano satellites. It also launched two of its own nano satellites, INS-1A and INS-1B. 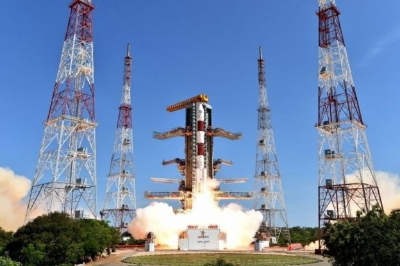 ISRO used PSLV’s XL variant – the most powerful operational rocket of India – earlier used in the ambitious Chandrayaan and during the Mars Orbiter Mission (MOM). All the satellites were placed in a 580-km polar sun synchronous orbit in a span of 20-25 minutes after launch. Since all the satellites were to be put in a single orbit, the rocket was not switched off and on.The major challenge for this mission was to hold the rocket in the same orbit till all the satellites were ejected. India had demonstrated its prowess in delivering value for money in the launch of its Mars Orbiter Mission.The probe was famously sent to the Red Planet in 2014 for just $74 million - less than the $100 million than Hollywood spent making space thriller "Gravity." 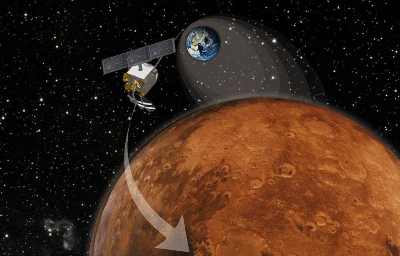 The Mangalyaan now has pride of place on India's new 2,000 rupee note. And now it gets even better. This record-breaking launch is another testimony to the frugal innovation that India is bringing to space transportation. 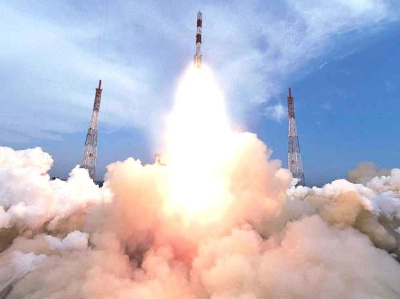 India's ability to launch multiple satellites in a single mission puts it on a firm footing in the global space market by making the Indian price more competitive in an exploding space market. Over the next five years, over 3,000 such satellites with sizes varying from a small shoebox to a 24-inch television set and weighing one kg to 50 kg are expected to be built and launched by various players, according to SpaceWorks Inc, a US space industry researcher. The biggest such move will be by OneWeb, the Softbank-funded satellite venture which has India’s Bharti as a partner. It will launch 648 small satellites to provide high-speed internet to remotest corners of the world. With this launch ISRO has strengthened its case to win the contract. There are two trends driving the business case of ISRO: first, there is a global shortage of launchers for small satellite missions; and second, there is a sudden rush of private industry in the US and Europe to send hundreds of satellites to space for various needs. These needs include weather tracking, navigation on the sea where there is little connectivity so far, and providing high-speed internet to remotest parts of the world. ISRO began launching foreign satellites on board PSLV in May 1999. Since then, it has gained credibility by launching foreign satellites successfully using PSLV. 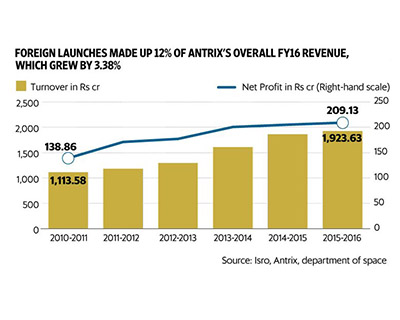 Deals are arranged by Antrix, the commercial arm of the department of space, and these deals are becoming more profitable by the year. The private companies cannot afford to launch their satellites independently. So they need to piggyback on missions from agencies like ISRO that have launch facilities. Setting a world record by launching the maximum number of satellites in one-go is a big business boost for Antrix Corporation in showcasing ISRO’s capability. The number of foreign satellites launched by India to date, before the current launch, is 79. This has earned the country more than $120 million. And India's space agency has already secured deals to launch dozens more foreign satellites. In 2015-16, commercial launches brought in Rs. 230 crore, which was 4% of ISRO’s average spending over the previous three years. 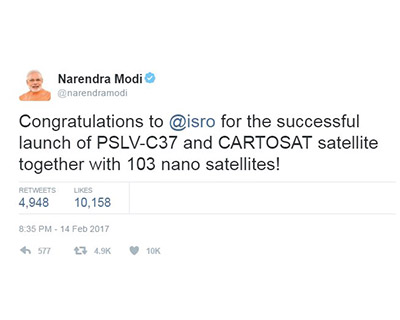 When else did ISRO launch multiple satellites? Placing multiple satellites in a single orbit with a single launch is not a new development for ISRO; it has done this several times in the past. It also placed several satellites in different orbits earlier in 2016. ISRO first set a world record for the highest number of satellites launched in a single mission when it placed 10 satellites in a PSLV on April 28, 2008. The United States placed 29 satellites in orbit using the Orbital Sciences-built Minotaur-1 rocket on November 19, 2013. Russia stole this record from US on June 19, 2014 by launching 37 satellites. Now, ISRO has reclaimed the world record it once held.And how! It can be safely said that when ISRO gives its commitment, it lives up to it. To borrow a popular phrase of Donald Trump, ISRO fulfills its commitment one hundred percent. It’s true. ISRO has a 100% success rate in foreign satellite launches. Beat that! In terms of price, ISRO is the most competitive player in the market. While a satellite launch on Arianespace’s rocket will cost about $100 million after subsidies, private player SpaceX will charge $60 million. In contrast, ISRO charged an average $3 million per satellite between 2013 and 2015. 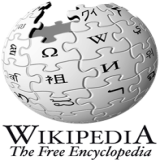 The other achievements are as great as the current record-breaking launch. Chandrayaan-1, India's first lunar probe, was launched by ISRO in October 2008, and operated until August 2009. MOM, or Mangalyaan, made ISRO the fourth space agency to reach Mars, after the Soviet space program, NASA, and the European Space Agency. ASTROSAT, India’s first fully dedicated space observatory satellite, was successfully launched in its maiden attempt along with six other foreign satellites on 29 September 2015. ISRO’s low-cost 1.5 ton satellite, which was injected into a 650 km orbit, is equipped with one UV telescope, a charge particle monitor and will carry four X-ray payloads. The successful launch of an over two-ton satellite has put India in the elite league of nations able to lift up such heavy satellites in the geostationary orbit. Only five other nations — US, Russia, France, Japan and China, have the cryogenic engine technology to lift such heavy satellites. So far, India has only been launching small and light foreign satellites, using the PSLV. In this weight class, there are not too many operators. However, in the heavier weight class there are many hungry competitors; for example Europe's Ariane rocket has established its reliability, and from the new lot there is SpaceX; but they have not provided many opportunities for small satellite operators. However, launching heavier satellites is where the big money is, which is why many players are even reducing the price of their rocket launches to bag more deals. India has been launching heavy satellites on its Geosynchronous Satellite Launch Vehicle (GSLV), but so far it has only been used for domestic satellites. If India can successfully start taking more heavy satellites to space, it could really fire up its position in a market that's worth many billions of dollars. 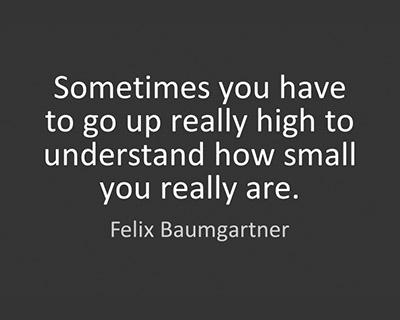 Note: BlueOrigin, owned by Amazon founder Jeff Bezos, is another fast growing ambitious rocket start-up. It wants to begin flights of the orbital New Glenn rocket from 2020. Chandrayaan-2 will be launched on India's Geosynchronous Satellite Launch Vehicle (GSLV-MkII) and land on moon by December 2018. The scientific goals of the mission are to further improve the understanding of the origin and evolution of the Moon. ISRO is conducting high-altitude tests with its own cryogenic engine that is expected to power the future missions with the heavier Geosynchronous Satellite Launch Vehicle-Mk III (GSLV Mk III). The GSLV Mk III has a capacity to carry around four tons of load. It is expected to save precious foreign exchange for India as the country is currently launching its heavier satellites through foreign space agencies. Taking a baby step in development of reusable rocket which will drastically cut down cost of access to space, ISRO successfully flight-tested an indigenous winged Reusable Launch Vehicle in May 2016, dubbed "swadeshi" space shuttle, from Sriharikota spaceport in Andhra Pradesh. 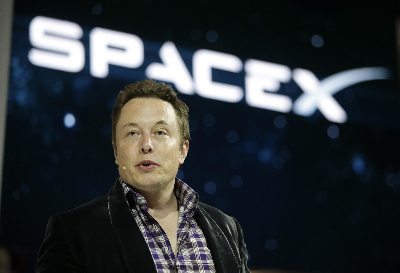 Reusable rockets will be required to bring down the costs of future commercial launches. SpaceX is close to perfecting this technology.